Nowadays, we use phones to share things in daily life with friends or relatives almost every day. Phones are convenient enough for us to save entertaining videos or record interesting scenes, for example, record Tango video calls. Then we share the videos with others and move them to the other phone. However, it will be hard to transfer videos between different devices like between Android and iPhone. 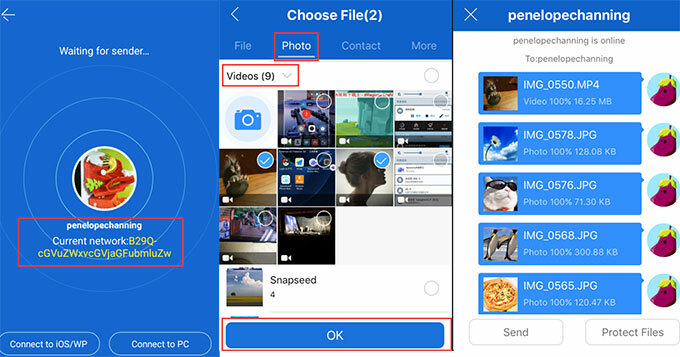 Therefore, the article below will introduce two ways about how to transfer videos from Android to iPhone and vice versa. 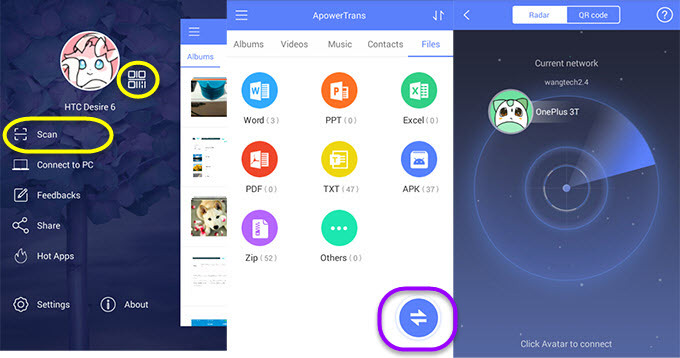 ApowerTrans is freeware that transfers videos, music, photos, contacts and files between phones. 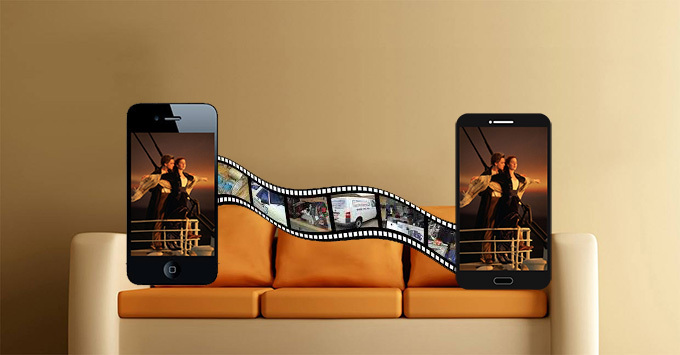 Supporting a wide range of devices, it is able to efficiently transfer videos from Android to iPhone and vice versa. This freeware contains a built-in video player so you can watch the video directly to help decide which to choose and send. What’s more, we all know that videos are larger files than photos or music and may lower the transfer speed. But ApowerTrans keeps a fast speed under strong WiFi signal. The tool shares the simplest interface without any ads or plugins inside. No malware exists to affect your data. 1. Download the program in the application store. 2. Activate the program. Under the same network, it allows you to scan the QR code. The other way is to press the round icon on the lower right corner to enter into Radar and then click the other device to finish the connection. You can open hotspot on Android device in case no network is available. To be more exact, you need click “?” in Radar to get the guidance. Below the instructions, switch the Hotspot on. Then make iPhone to connect the WiFi named Apowersoft. You will find the other device in Radar and click it to connect. 3. Press “Videos” and choose files in the check box on Android and send them. 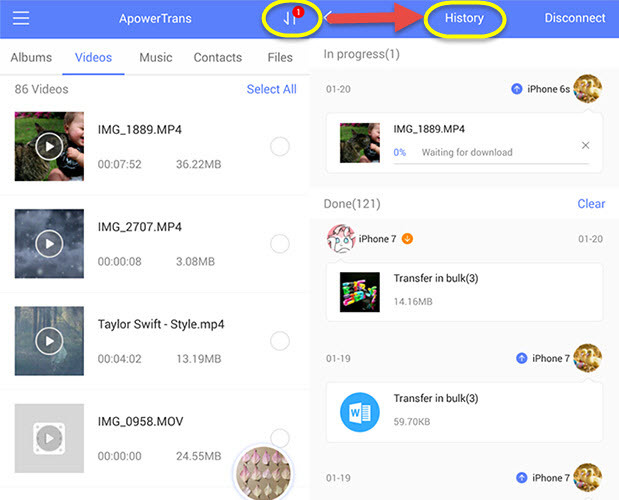 By the way, if you want to transfer videos from iPhone to Android, follow the similar steps above but select videos on iPhone and forward them. 4. A red icon shows up on the icon at the upper right corner, informing you the transfer has been built. Click it to view “History” and check the transfer process. SHAREit holds a large number of users because of its abundant functions. 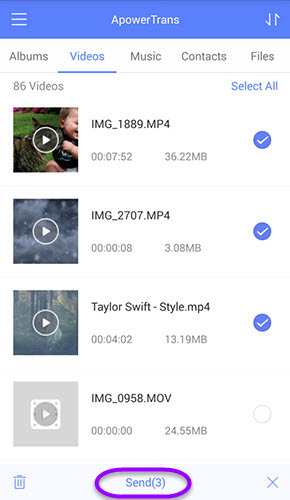 This app can transfer music, apps, photos, videos and files between phones at a really high speed. Step one: Download the program and then launch the program on both phones. On Android device, click “SEND” and access “Select Files”. Press “Videos” and choose the wanted ones. Then click “Send” to enter into Radar. On iPhone device, click “RECEIVE”. Next, you will see the iPhone in Radar on Android device and click it to connect. 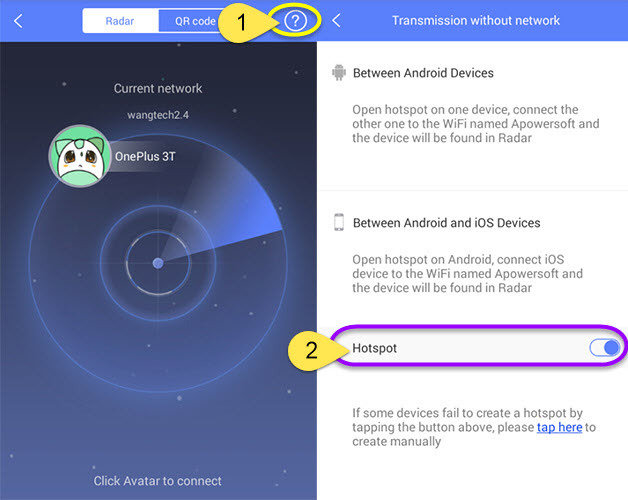 For Android device, tap “RECEIVE” to get into Radar and then it will create a hotspot automatically. For iPhone device, go to System Settings to connect the given hotspot. Next, return to the app and press “SEND”. Select videos under the item named “Photo” and click “OK”. You will soon find the Android device in Radar. Tap to connect it. Once the connection has been made, the selected videos will be transferred in just a few seconds. Step three: During the process, you can see the status of the files directly. Meantime, you’re allowed to cancel the transfer at any time before it’s completed. However, you can only see the current transfer process. If you want to check the previous history, you have to end the connection first and go back to the interface. However powerful functions SHAREit has, there are still tons of ads and useless information in it. Users may find the steps are complex and feel confused when facing so many function buttons. Incidentally, it will be troublesome to transfer files from iOS-based devices due to its system restriction. With the help of these tools, it is convenient and simple to transfer videos from Android to iPhone and vice versa. Either tool has its specialty in different cases. It is up to you to choose which one suits you best. But do try out both programs by following the steps above. Then make a satisfying decision.